Are bioplastics the best solution for sustainable packaging in a circular economy? Is biodegradable or bio-based material ‘greener’ than multiple use plastics? Conflicts with food production and an increase in the use of fertilisers and pesticides are not the only concern, analysis that we’re currently conducting for the European Commission suggests that bioplastics are only better than plastics if degraded appropriately. Dora Fazekas discusses how the growing consumer awareness regarding plastics needs to be coupled with evidence-based information. A circular economy aims at extracting the maximum value from all raw materials, products and waste, reducing emissions and improving energy efficiency. Although there are various definitions of ‘circular economy’, all describe a non-linear approach of creating value: cradle-to-cradle (instead of the traditional cradle-to-grave), relocating waste from the end of the supply chain to the beginning. In effect, nothing new is invented here, everything is reused, as much as possible, re-manufactured or recycled back into a raw material or used as a source of energy. Why is the plastics sector important? The plastics sector is a manufacturing sector that receives most attention from a circular economy perspective, with regards to its recyclability and reusability, as well as the generation of waste and emissions. Plastics are associated with a throw-away society and high levels of waste, especially when it comes to single-use plastics and packaging. 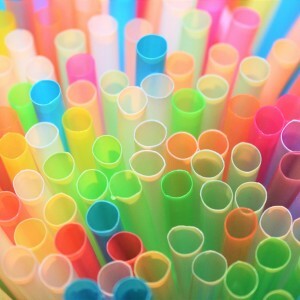 In January 2018, the European Commission adopted the Strategy for Plastics in the Circular Economy, which outlines the EU’s future policy priorities for the plastics sector: a plastics ban in certain products, consumption reduction targets, collection targets, labelling requirements and awareness-raising measures. Our ongoing analysis for the European Commission’s DG Environment (not yet published) aims to contribute to the evidence base on the link between production and environment. The study includes a cross-cutting analysis of policy pathways to reduce the environmental impact of production and use in five different sectors (food and drink, plastics, motor vehicles, water and waste). What benefits would a plastics tax bring? The plastics sector was one of the sectors we studied and the circular economy was one of the pathways we looked at. Here the amount of recycling and reuse of products within the economy is increased reducing virgin material consumption and thereby reducing environmental impacts. Our analysis suggests that the net cost of a tax designed to reduce the use of plastics is minimal. In modelling a plastics tax designed to reduce the use of plastics we found that while environmental benefits may be substantial, economic costs of such a measure are minimal. 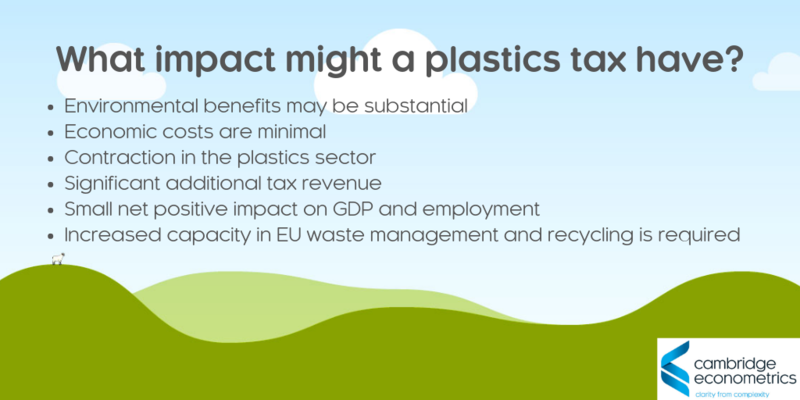 Different scenarios result in very similar effects, while the magnitude of the impact is driven by size of the tax: contraction in the plastics sector, significant tax revenue, and a small net positive impact on GDP and employment. As always, there are caveats to the modelling, such as to achieve the modelled circular economy progress, increased capacity in EU waste management and recycling are required. Would bioplastics solve the problem? Single-use plastic items, single-use non-plastic items (as alternative, substitute products), multi-use items and bioplastics were all included in our research. At one end of the analysis were ‘single-use plastics and packaging’ designed to be used only once. At the other were bioplastics defined as bio-based, biodegradable or both, which are increasingly being applied to packaging and might be more sustainable if used appropriately. What is the role of consumers? Consumers are becoming more aware that their consumption has an impact on the environment. This is one of the factors that influences packaging demand. Food products in particular are often considered over-packaged by consumers. However, plastic products manufactured with recycled content are often perceived as having lower value, which leads to lower demand for and consumption of recycled plastics compared to virgin plastic products. Polymer mix and contamination of other materials and additives is one of the reasons for the lower technical and economic value of secondary plastics. However, recent technological advances aimed at bridging the quality gap between virgin and recycled plastics can have important positive impacts on consumption levels and therefore on recycling rates. Consumer preference is gradually shifting towards alternative, more sustainable materials but it is crucial to provide evidence-based information for the green-sounding credentials of the bioplastics industry. Moving towards a more circular economy would have clear environmental benefits. Waste would be minimised and the maximum potential of raw materials realised. What is less clear is the impact of circular economy activities on the wider economy, specifically on the labour market. In a follow-up circular economy blog Unnada Chewpreecha will look at how we model the impact of circular economy on the labour market, based on separate work we’ve done for the European Commission.